The Indians have valued Jones' defense since selecting him in the second round of the 2016 Draft, but now his offense is consistently turning heads. MLB.com's No. 67 overall prospect hit .283/.405/.466 with 19 homers and 66 RBIs for Class A Lake County and Class A Advanced Lynchburg in his first full season. And after Jones received a late July promotion to the Carolina League, his numbers only got better. "It was impressive to see the way he carries himself, the way he handled himself there," said Rouglas Odor, who managed Jones on the Hillcats last year. "And his ability to drive the baseball, using the whole field; he can drive it to the middle of the field [and] the other way. That's very special, to see a young kid do that. It was very nice to see him have success at that level." Odor, now the manager of Double-A Akron, will get to continue to work with Jones this season. James Harris III, the Indians' director of player development, is excited about the progress the 20-year-old has made on both sides of the ball. And while there is still work to be done, the third baseman is showing growth, cutting his errors down from 22 in 53 2017 games to 27 in 105 games in 2018. Jones is a three-true-outcomes type of batter who has shown patience, but could also eliminate some strikeouts. If the left-handed hitter continues the progress -- both at the hot corner and at the plate -- he'll be in a great position for Spring Training battles in 2020. After hitting .526 in high school, Freeman has had little trouble keeping it going in pro ball. The Indians' No. 3 prospect started his career with the Rookie-level Indians in 2017, then began 2018 in extended spring camp. Three weeks after turning 19, Freeman was assigned to Class A Short Season Mahoning Valley. There, the 2017 CBB pick led the New York-Penn League with a .352 average, 95 hits, 29 doubles and 49 runs in 72 games. Freeman also showcased some speed with four triples and 14 swipes in 17 attempts. "Definitely a guy who puts the bat on the ball," Harris said. "A leader, very vocal, he's mature defensively and he plays a pretty good shortstop." Freeman played 10 games at second compared to 52 at short last year. But in a system full of strong shortstops, Harris said the California native will have to play second more often. While most of Freeman's tools grade out as average, his bat is considered one of the best in that crowded infield of the Cleveland farm system. He'll get his first real challenge this summer in the Midwest League, and Harris looks forward to seeing him continue to grow. Few had a more exciting 2018 than Sandlin. In June, the reliever was drafted out of Southern Mississippi in the second round, and by the end of the August, he was pitching at Double-A. "He has the ability to keep hitters off-balance and he's not afraid to throw any pitch on any count," Odor said. "He has a nice sinker, a nice breaking ball, a nice changeup, and he was throwing a lot of strikes and kept the ball down in the zone." 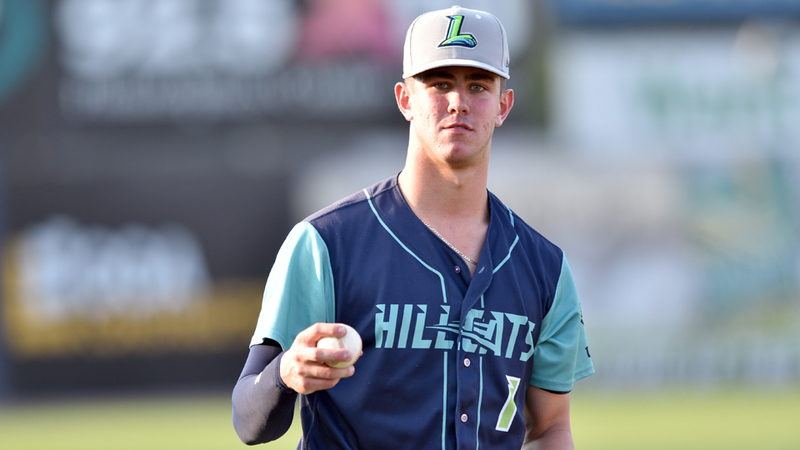 Sandlin held foes to three runs in 19 2/3 innings (1.37 ERA) combined for the Rookie-level Indians, Lake County and Lynchburg. But when he got to Akron, he was finally challenged, giving up five runs in 4 1/3 frames. Overall, the 22-year-old went 2-0 with a 3.00 ERA, 36 strikeouts and three walks in 25 appearances while converting five saves in five opportunities. "He's a unique guy with a unique look.," Harris said. "The slot is a little bit different. He can raise and alter that slot, locates the fastball well and is an uncomfortable at-bat because of the unique look." With his plus-fastball leading the way and the numbers to back it up, many thought Sandlin could have gotten the call last September. But given that his college season started in February, it was time for some rest. He's still in a very good place to become the first 2018 Draft pick to reach the Majors. "He's going to face some more mature hitters this year," Harris said. "I think if he can help us in the Majors out of the bullpen, then we'll bring him up." Bobby Bradley has been a big name in the Indians system since he was drafted in 2014. In that time, he's been one of the top sluggers in the Minors, averaging 27 homers in full-season ball. But power has never been the issue, as Bradley also averages 148 strikeouts. And while his composite on-base percentage in four seasons is .335, it's steadily declined each year. "He's a big, strong, powerful guy. If he runs into a fastball, look out," Harris said. "They try to pitch around him. If he can stay disciplined and stay away from the swing-and-miss pitch, he can do some damage." Bradley returned to Double-A to start his fourth season last spring, hitting .214/.304/.477 with 24 jacks in 97 games. While the campaign didn't seem great on paper, Harris and the Indians felt like the 22-year-old made a lot of strides. After he lost "a lot of weight" in the offseason, improved his defense and showed a better ability to work the count, it was finally time for Bradley's Triple-A debut, 508 pro games into his career. "Not just [being more selective] -- people aren't just going to throw him fastballs. He has to be able to be on time with the fastball and adapt to breaking balls," Harris said. "He's working on that. And we look forward to another year of him improving." Like Sandlin, Karinchak had a speedy season out of the bullpen. After a tough pro debut in 2017 in which the Bryant University product posted a 5.79 ERA in 23 1/3 innings for Class A Short Season Mahoning Valley, Karinchak was strong out of the gate in 2018. The 6-foot-3, 230-pound hurler yielded four earned runs over his first 38 1/3 innings across 32 appearances as he advanced from Lake County to Lynchburg. "He controls mid-90s, high 90s, and then his breaking pitch is sharp and hard, so it gives him a lot of chances to get hitters out, and he did it there," Odor said of the righty's time in the Carolina League. "He also struck out a lot of hitters, so he has that ability. .. So I was very impressed with him." Harris said Karinchak has increased his speed while remaining "highly competitive." Although he came back down to earth a little with Akron -- 2.61 ERA in 10 1/3 IP -- Karinchak continued to attack with his fastball. In total, the 23-year-old notched 81 strikeouts with 36 walks in 48 2/3 innings. If Karinchak gets off to another strong start with Akron, he should quickly move to Columbus and beyond. He might be the club's No. 30 prospect on Opening Day, but that shouldn't stick for long. "The sky's the limit for him," Harris said. "As you've seen, in our organization, we're not afraid to promote guys to challenge them." More to keep an eye on: Top Indians prospect Triston McKenzie was primed for a big 2019 after being held out until June with a forearm injury last year. But then the No. 41 overall prospect strained his upper back at big league camp, and he'll likely begin another season on the bench. ... Outfielder Oscar Mercado and shortstop Ernie Clement both posted strong Cactus League numbers, putting themselves in good position for when Cleveland needs a callup. ... After three seasons in the Nationals system, Daniel Johnson begins his Indians career. The right fielder was traded in the Yan Gomes deal in November.